A geothermal silencer is like a separator operating at atmospheric pressure. It is normally connected directly to a well and a separation plant for bypass or emergency discharge. The silencer reduces the high – frequency noise discharging from an open pipe to a low-frequency rumbling noise that is more bearable to human ears. The earlier Wairakei silencer design consisted of twin barrels, and the body was made of timber. The modern silencer design consists of a single barrel made of corrosion-resistant steel, sometimes internally lined with concrete (Fig. 13). Fiberglass barrels worked well for silencers not in constant use. Some new silencer designs have a cone fitted at the top of the barrel to increase the steam velocity so that it is dispersed farther away from the silencer area. The noise can be further attenuated with an annulus full of scoria rock in the silencer barrel. For a dry steamfield, a silencer is commonly just a pit full of rocks. A bypass pipeline discharges the dry steam at the bottom of the pit. FIGURE 13 Modern single-barrel silencer. ing system (SGS), steam collection system (SCS), or fluid distribution and collection system (FDCS). When wet steamfields, such as Wairakei and Cerro Prieto, were first developed, geothermal two-phase flow was not well understood and two-phase pipelines were kept to a minimum. So, separators were installed at the wellheads, and separated water and steam were transported as single-phase fluids from the separators to the desired destinations. So, each wellhead had a complicated pipe network. Nowadays, two-phase pipelines are used exten­sively to transport geothermal fluids from several wells to feed a separation plant. This design greatly simplifies the pipe network at each wellhead and the whole steamfield because it allows the use of fewer large diameter pipelines in the steamfield. Another more important advantage is that large diameter pipes cause less pressure loss of the fluid being transported, thereby conserving energy. The location of a separation plant is important because it affects well outputs and the total pressure loss and, ultimately, the economics of the power project. Two other factors affect the location of the separation plant: steam quality and steam pressure control. The efficiency of a separator can be 99.99%. For a large separation plant, there may be 500kg/h of water carryover in the separated steam. This water carryover needs to be removed as much as possible before it reaches the steam turbines because the water carryover in droplets traveling at high velocity erodes the turbine blades or solids precipitated from the water deposit in the turbine nozzles, ultimately choking the turbine output. There are two ways in which to remove the water carryover. One is to install a demister or scrubber at the power station end. The other is to install drain pots along the steam pipelines. 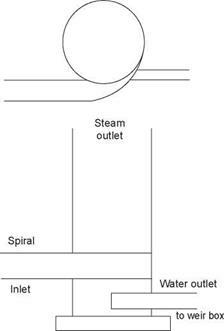 The drain pots do not work if the steam velocity is high and the water carryover travels as droplets with the steam. There is also a minimum number of drain pots spaced at a minimum distance apart for the drain pots to function properly. This means that there must be a minimum length of steam pipeline downstream of the separation plant to allow for the scrubbing of the steam phase. The second factor is that a minimum pipe length, and hence volume, is also required for the pressure control system to function properly. A major problem with a liquid-dominated steamfield is the large quantity of separated water that requires disposal. When Wairakei was developed roughly 50 years ago, environmental concerns were not an issue and the separated water system was designed to simply drain into the nearby Waikato River. Nowa­days, the only acceptable method is reinjection (unless the field is situated near the sea). Either the water flows down the well by gravity or, more often, a pump is required to increase the injectivity of the well. A control system is generally required to stop flooding or steam carryover. The location of a reinjection well is important. A reinjection well within a steamfield can replenish the geothermal fluid that has been withdrawn, but cooler reinjected fluid may break through to the production wells and cool the production fluids. Nowadays, the strategy is to reinject at the perimeter of the steamfield to minimize the risk of the cooling effect. A problem with this strategy is that the permeability on the margins is generally poor, so more wells are needed. The aquifer flow paths can also change under exploitation so that reinjection wells can have rapid returns to production areas where initial tracer tests showed no flow. In the steam-dominated field of The Geysers, waste sewage water is reinjected to replenish the drawdown of the field.